Opening Friday, October 18, Reception 5-10. 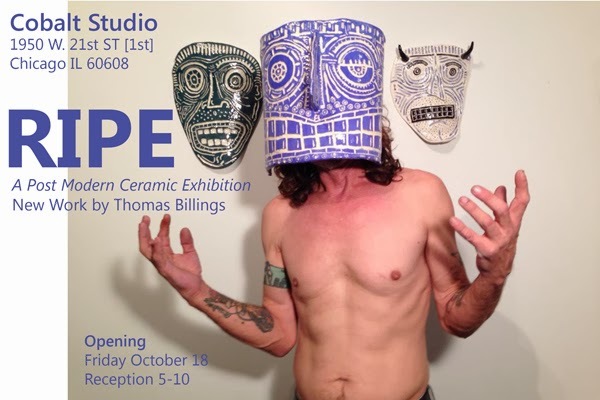 Tom Billings continuously proves himself a dedicated artful workaholic. While participating in & co-curating exhibits in Chicago’s bars, clubs, cafes, and painting: murals, street art and the like. He was also exhibiting in galleries in New York and Chicago earlier this year. Tom has simultaneously been prolific in the ceramic studio. Tom’s production of ceramics into the small hours has yielded some wonderful results. His mask series which depict Dante’s Seven Deadly Sins are featured. His style yields a series of glazed masks, directly inspired from his recent painted portraits. This October, he will exhibit at Cobalt Studio. It includes several small vessels, organic “pear-like” forms and painted tiles. All the work has been produced in Chicago and will be shown as a complete body of work for the first time.